How big are your company aspirations? Would you like to expand your business into the world’s largest economy – the United States? If your product or service is selling in your own country, it might be time to start looking overseas to the US for growth opportunities. Many individual US cities have larger economies than entire countries. A report by HIS Global Insight (http://usmayors.org/metroeconomies/0712/FullReport.pdf) showed 12 US cities have economies that rank as the 50 largest global economies. That’s a lot of money and millions of new customers spread across the United States. Take for example New York City. It has a $1.29 trillion economy, which ranks higher than the economy of Mexico ($1.15 trillion), South Korea ($1.12 trillion) and the Netherlands (S838 billion), according to that report. But where do you begin as a foreign company, trying to enter the most complex market in the world? 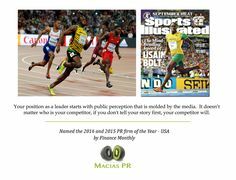 My public relations company, MaciasPR, has worked with many international companies and start-ups seeking publicity in the US. We have gotten our clients publicity inside some of the most influential news organizations, including the New York Times, CBS News, Good Morning America, CNN, Fox News, as well as targeted industry publications like Venturebeat, BusinessInsider and Ecommerce.com. As an international company entering the US, you need to first understand that this market is more complex than your native country. The US market has diversity and niches that must be reached through unique avenues. Even if you are targeting the same American demographic, your strategy for reaching them will vary based on the region of the country. As a journalist who worked in the West Coast, Southeast and Northeast, I can tell you news is approved differently based on the region of the country. One approach does not fit all when it comes to getting your story told through the media. You need to tailor the message to the individual market. Finally, don’t assume just because you are entering the US market that you can’t afford a solid PR campaign. A publicity campaign is almost always more cost efficient than an advertising campaign. The cost for a PR campaign varies by the complexity and scope of the campaign, but it can increase your brand awareness, introduce a new product and improve your website’s ranking with Google. (Click here to read how a PR campaign can improve your SEO ranking). More specifically, do you want to run a national or local media campaign? Is it a B2B or B2C campaign? How complex is your message? All of these questions factor into the cost for a PR campaign in the US. We can guide you via Skype if you would like to hear a more targeted media approach for your company. You can read more on our firm at www.MaciasPR.com.